I've been busy with music/Hypnos, my dad's visit to Portland, writing, and all the rest of life. Funny, when I blog regularly I find it easy to keep on blogging regularly, and once I stop it's very easy to STAY stopped. So many things are like this, especially exercise and creative activities. Running every single day is easy. Taking a week off running, and then starting to run again that first time is much harder. I still write six days a week, exercise six days a week, work my day job five days a week, listen to tons of music, watch lots of movies with my wife, and don't get enough sleep. Lately I'm working on a lot of stories simultaneously, even more than usual for me, and the stories are all over the map. I'm writing an SF story about a group of robotic domestic helpers left behind by their humans on an Earth-like colony, a horror-tinged SF story about some weird stuff lurking in the bottom of a deep mine (not started in response to the major news story about miners in Chile), finishing up a dark fantasy or horror bit about a family vacationing at a lake house and coming under the influence of some local entities. I have another odd, dark bit about a married couple who retreat to a cabin out in the wilderness near Mt. Hood and begin to lose all connection to the world they left behind. I'm also continuing heavy cuts on my two "salvage project" stories I mentioned before... mega-long stories that needed to lose 2/3 of their length before I could even assess how to turn them into something interesting. They're down from 14,000 words to 5,500 and from 11,000 words to 5,300 so they're getting close to where I can see what they need to be. This has been a really useful and interesting test or experiment, but I don't know that I'd do it again. I could have easily rewritten these stories from scratch in less time, and with better result, but then again that wasn't really the point. I've got the same nine final drafts still circulating among various markets. My two longest-pending submissions are both Writers of the Future, for 2010-q3 (June-ending quarter) and q4 (Sept-ending). Jeez, sending those guys a story means keeping it from other markets for about six months, it appears. I realize they get a lot of submissions but it seems they could finish one quarter's reading before opening it up to the next quarter... and then the one after that. They just announced q2 results, and they're reading stories for q3, q4, and 2011 q1 (quarter ending December) all at once. Sheesh, talk about slush pile. I'm still reading Laird Barron's Occultation, an absolutely top-notch collection. Seriously, some of the best strange/dark short fiction I can remember reading, not just recently, but ever. When I get through that last story and a half (I'm reading other stuff in parallel so it's taking a while) I'll write a real review. Just finished The City & The City by China Mieville, and I'm very impressed. I knew it would be good, based on all the reviews and awards, and interviews I've read with the author. I can tell he's just a super-sharp guy and I've owned copies of several of his books for a while and intended to get to them... but finally dived into one of his newest. Before I move on to Kraken I'll probably jump back to Perdido Street Station since that's been on the "must read soon" list since, you know, a really long time ago. Lessee, I think I mentioned finishing Old Man's War, which was really good, and not as lightweight or pastiche-y as I expected. I'm on to Charles Stross's Singularity Sky, which is fully of SF-nal goodness, and pretty well written, though at times a little too heavy on the political & military detail. I'm not far into it so I'll reserve judgement. I did mean to blog a bit more about the HP Lovecraft Film Festival, which was a lot of fun and quite memorable. But this is a "rust buster" blog so I'll wrap it up, and leave stuff to blog about later this week. I've been a reader of John Scalzi's blog, Whatever, since long before I had read any of his work. The first thing of his I encountered was his installment in the five-author collection Metatropolis, where I found Scalzi's humorous, breezy blogging style carried over to his narrative fiction. 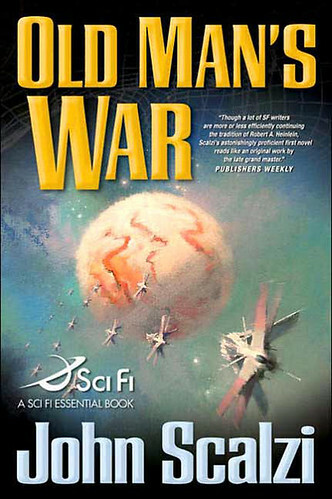 Old Man's War is similar, despite mostly focusing on a more serious subjects such as war and colonialist expansion. I don't think I've seen a single mention of this book that didn't refer to Robert Heinlein's work, most often Starship Troopers, and after reading this, it's not hard to see why. It really is fairly straightforward in its influence, but that similarity never makes Old Man's War seem derivative in any negative sense. The setup is simple: on Earth a couple of centuries from now, 65 year olds have the option of signing a contract to join the Colonial Defense Force, so that when they turn 75 they undergo some kind of mysterious physical transformation process to become fighting machines, and leave Earth forever to bounce around the galaxy, fighting various weird aliens for control of habitable planets. The CDF initiates discover the nature of the process that allows them to go from elderly to fighting form, and as in Starship Troopers, we follow the new recruits from training to initial skirmishes, and watch them lose friends to the inevitable effects of war. We also learn more about various interesting elements of the CDF, including the "Ghost Brigades" (title and subject of the first sequel to Old Man's War). Scalzi is a stronger storyteller than a stylist, but the characters and dialogue are entertaining and likable. I find myself ready to follow along in this series and learn more about the CDF and their various interesting technologies (a "Skip Drive" for example, which is more a quantum reality-shift device than a true drive), especially the "ghost brigades." Scalzi has created a great premise, and even if I hadn't come to this book so late that multiple sequels had already appeared, it would have been plain enough to me that subsequent development could definitely be done in this story's world.